A minimalistic mod allowing changing vanilla belt settings, including belt speed and underground belt max distance. Also adds options on unlocking loaders. Feel the vanilla transport belts being too slow, especially when compared to the logistics bots? Feel the express transport belts still inferior to logistics bots, regarding its cost? 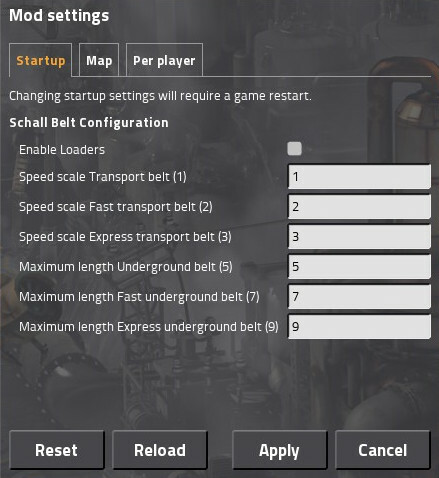 Want to scale belt speeds to other mods? Want the underground belts to go further? Want to use the vanilla loaders, without adding any new entities to save memory usage? If you have any of these wishes, this mod is for you! This mod does NOT add any new items or entities to your game, so will not use extra memory or take longer loading time. This mod allows editing belt settings from the options menu, under "Options" → "Mod settings" → "Startup" tab. In short, the base speed of 15 items/s (updated to 0.17.4) is used to define the speed scale = 1. The fast and express belts being speed 30 and 45 items/s, have speed scale of 2 and 3 accordingly. This mod allows you to freely set the speed scales. You can set any numbers you want, even with non-integral numbers. It is advised to use one of the following sets though. - At scale 9 (120 items/s), even fast inserters are not fast enough to grab items from non-full belts. You may want to reserve such high speed for mainbus, using splitters to divert to lower speed belt for production input. - Up to scale 9 (120 items/s), loaders can still catch up. Loaders will stay at this loading speed even with higher belt speed, due to engine limitation. - At scale 12 (160 items/s), splitters is still working fine. They may stop working and blocks if set to be higher. This mod has a soft safety limit at this scale. - At scale 16 (213.33 items/s), even the belts will glitch (non-full belts). If you want to test the "limit" of the game engine, you may edit the settings file with a text editor and test yourself. The underground belts of 3 tiers can go maximum distances of 5, 7 and 9 respectively, in the base game. Two suggested settings are listed below. A loader is an entity placed between a belt and a container (e.g., chest, assembling machine). It transfers items between them, depending on the direction of placement. Inserters do have similar role, but loaders perform at the speed of the belt. 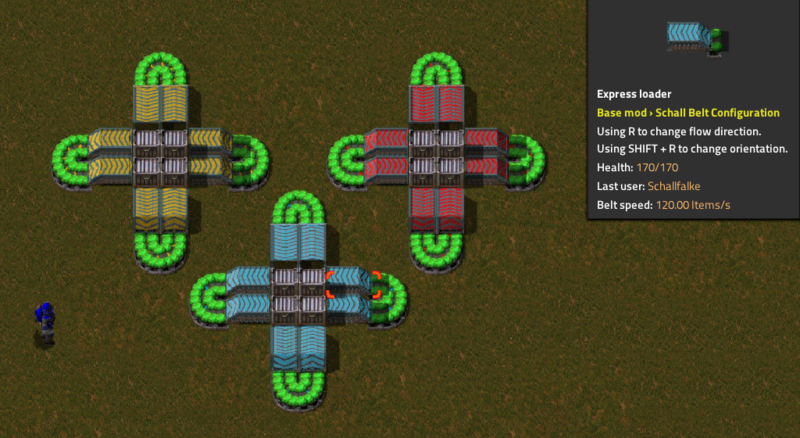 The base game have three hidden entities: loaders of three belt speeds. They exist in the code, but hidden because of "balance" concerns. 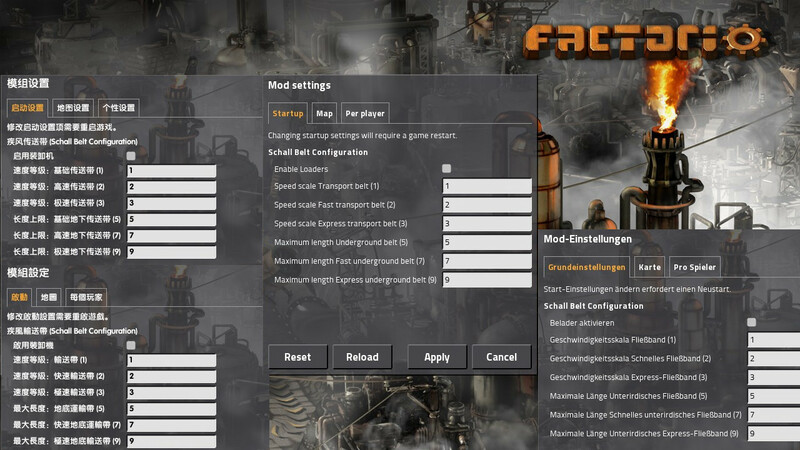 This mod set the speed of loaders to change accordingly, and provide the options to allow them for players' use. The three tiers of loaders are unlocked by the three logistics technologies (just like the belts, underground belts, and splitters). The default is off. You will need to check the "Enable Loaders" option to enable them. In case you have already installed other mod introducing loaders, you should keep this option off. If enabled, this mod adds these loaders together with custom graphics, replacing the vanilla B/W arrow plate placeholder graphics. Hotkey (can be adjusted in "Controls") is also added, to allow quick adjustments of loader direction and orientation. There is another minor feature. This mod modifies the flags, so loaders can be upgraded using the new 0.17 "Upgrade Planner", just like what can be done to belts. This mod do not modify the existing content in the save game. This mod should be safe to be disabled/uninstalled at any time. If any other mods unhide the vanilla loaders, they should take precedence. Therefore, please uncheck "Enable Loaders" option of this mod, under "Options" → "Mod settings" → "Startup" tab, to avoid "double unlocks" on the loaders. Apart from that, these mods should work together. Loader Redux is fully compatible. Just be sure to uncheck "Enable Loaders" option. It has some cool features like loader snapping! Deadlock's Stacking Beltboxes & Compact Loaders if fully supported. The beltboxes and compact loaders would run at the configured belt speed as well! If you like this mod, and would like to provide other translations, please do not hesitate to send me a message. (Corrections on spelling and grammatical mistakes are welcomed as well.) That will be included in the next version.